What is Speeding in California? Speeding is the act of driving a car or other motor vehicle faster than is legally allowed. It includes driving faster than allowed in any particular area, traveling at a speed too fast or unsafe for conditions (the Basic Speed Law), and/or driving in excess of a posted maximum speed limit sign (the Maximum Speed Limit). Traveling at high speeds on roads and highways in California can contribute to causing greater traffic injuries and worse collisions. The faster a car or other heavy motor vehicle travels when it is involved in a collision, then the more likely the collision will result in not only injury but greater injury and possibly even death than if the driver was traveling at a reduced slower speed. In addition, the faster the speed the driver is traveling, the greater the needed stopping distance required to stop the driver’s car or other vehicle to prevent a collision. Further, the faster the driver travels, the less time the driver has to stop or to try to avoid a dangerous hazard on the road, such as debris that has fallen from a truck or other vehicle or animals walking on the road, or a collision with another car, truck or other vehicle. If you were involved in any injury accident involving a speeding car, motorcycle, truck or other vehicle, or a family member killed with a wrongful death claim, because of a speeding car or other vehicle, do not make any decisions unit you call us first. We know how to win excessive speed cases! Please contact our very experienced personal injury and wrongful death lawyers now for an absolutely FREE consultation and case evaluation. 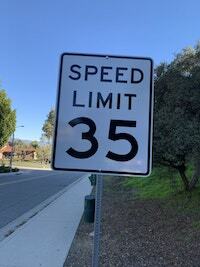 What is the Basic Speed Limit in California (aka “The Basic Speed Law”)? The State of California follows the “Basic Speed Law” which means that drivers in California must never drive faster than the speed which is safe for current conditions. See the “ California Driver Handbook – Laws and Rules of the Road”, published by the State of California, Department of Motor Vehicles. “ No person shall drive a vehicle upon a highway at a speed greater than is reasonable or prudent having due regard for weather, visibility, the traffic on, and the surface and width of, the highway, and in no event at a speed which endangers the safety of persons or property .” California Vehicle Code Section 22350. What is the Maximum Speed Limit in California? Regardless of the speed a driver may believe safe for conditions, the maximum speed limit on most California highways is only 65 miles per hour (mph). However, a driver may drive or travel at 70 mph if and where it is specifically posted to allow this faster speed. On a two-lane undivided highway (that is, a total of two lanes or one lane in each direction), unless there is a different sign the maximum speed limit is 55 mph. In addition, the maximum speed limit for cars and other vehicles towing a trailer also is 55 mph. There may be other lower than 70 mph speed limits posted on various roads based upon the type of road and traffic in the area. These posted speed limits are based on ideal driving conditions, or the best driving conditions, so when the driving conditions are not ideal, such as when there is rain, snow, fog, wind or dust, California drivers should reduce their speed accordingly. What is the Number of Fatalities in California Caused by Speeding? If you have been injured by a driver who was speeding or someone you care about has been injured or killed in a speed related collision, or any car accident anywhere in Los Angeles, the San Fernando Valley or in the state of California, we urge you to contact our expert injury lawyers now for an absolutely FREE COURTESY CONSULTATION. There are many procedures and time deadlines, so please do not delay and risk losing your rights. If you need help, please contact us now. We are not a referral company, but born and raised in Southern California, with a full staff and resources to successfully win your case. What Are The Results of Accidents Caused By Speeding? As stated above, when a driver is speeding there is less time to take evasive action to avoid debris on the road or to avoid another car or truck stopped in front of the speeding driver. Further, the impact and damage, because of greater momentum when speeding, is usually much more devastating. Momentum is essentially the mass or weight of the speeding vehicle multiplied by its speed. The heavier and faster the vehicle travels, the greater its momentum and likelihood of causing greater damage to the other car or vehicle and greater injuries to the driver and any passengers in the other car or vehicle. The most common results of a collision caused by speeding or traveling too fast for conditions are property damage to the other cars and vehicles involved and injury to the driver and passengers in those vehicles. In a typical two-vehicle collision, often a rear-end collision when the at fault driver was speeding or just traveling too fast for conditions and not paying attention, the property damage is to the rear of the first vehicle and front of the second, at fault speeding vehicle. The amount of damage to each vehicle varies depending on the type and structure of each vehicle. For example, sometimes when a small car is rear ended by a larger speeding vehicle there may be major rear-end bumper damage to the smaller car and little or even no damage to the front of a larger truck that caused this rear-end collision. And some times we see little visible damage to the rear of the first car or vehicle (e.g., when it has a bigger, stronger or impact absorbing rear bumper) while the full front-end of the second vehicle (that is, the car or truck rear-ending the front car or other vehicle) shows major front grill damage and other damages. Our team of lawyers has handled many accidents caused by speeding and/or traveling too fast for conditions, including rear-end accident claims. It is important to accurately document all the damage from such collisions, including to take good clear photos of all cars and vehicles and to take your car to a good auto body repair shop and obtain detailed estimates of all damage to clearly document all damages because insurance adjusters dispute injury when the visible property damage to the claimant’s car does not appear too significant. In a typical accident or collision caused by speeding or excessive speed, common injuries that occur include injuries to the victim’s head (concussion) and face, including to the jaw, frequently referred to as TMJ injuries, neck and whiplash injury, shoulder, back and knees. Some of these injuries can be very serious, sometimes even requiring surgery to one’s neck, back, shoulder and/or knee. Prompt medical attention is advised. If you need any assistance in getting medical care and treatment, please contact us right away as we usually can find not only excellent medical care but care on a lien basis for our clients which means NO payment is due until your claim is resolved. What Damages Can Be Recovered From Injury Accidents Caused by Speeding? Our personal injury and wrongful death lawyers and law offices seek all available damages and compensation permitted under California law caused by speeding drivers, including for all medical & hospital expenses; loss of earnings and earnings capacity; loss of enjoyment of life activities; all pain, suffering, inconvenience & emotional distress; punitive & exemplary damages when appropriate; and, of course, all damages for property damage, including for repairs, total loss pay-offs, rental, tow and storage, loss of use (even when a car or vehicle is not rented because the victim was deprived of the use of his or her car, truck or other vehicle), and diminution in value (i.e., loss n value)when the damaged car or vehicle is worth less post repairs than prior to the collision, as more fully discussed in our web page on Car Accident Damages. How to Find an Experienced Lawyer If You Were Involved in a Speed Related Accident Collision in Los Angeles, Van Nuys, Woodland Hills or Anywhere in California? Our car accident injury & wrongful death accident lawyers have been representing injured victims and their families who were victims of speeding drivers throughout all of Los Angeles and California for over 43 years. During that time, our personal injury law firm has successfully resolved thousands and thousands of car accident cases and recovered over $100 million for our clients. If you or someone you know has been involved in any car accident involving excessive speed or other personal injury accident case, we would like to discuss helping you or the person you know. We invite you to read about our attorneys who handle accidents caused by excessive speed and also to see what others say about us. The insurance companies have trained adjusters working to increase their profits and either limit or even deny your claim, so please do NOT let them take advantage of you. We want to help you. Please contact our law offices now to speak to one of our injury accident attorneys who handle cases based on speeding or excessive speed for an absolutely FREE consultation.